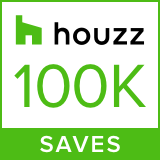 We’re honored to have been voted “Best of Houzz” by the home design website’s community of users again this year. The site’s more than 35 million users chose their favorite design and landscaping companies, and Houzz awards badges according to that popular vote. Hursthouse is eligible in two categories, and was recognized in both. The Design badge indicates that our landscape design work was among the most popular on Houzz, while the Customer Service badge shows that we were among the best-reviewed landscaped design companies in the nation again this year. We’re honored to be recognized, and looking forward to another great year of landscaping for life!